Are you among those who flounder every morning missing breakfast in a rush to make it to work just in time? If yes, then this post will help your struggling mornings. 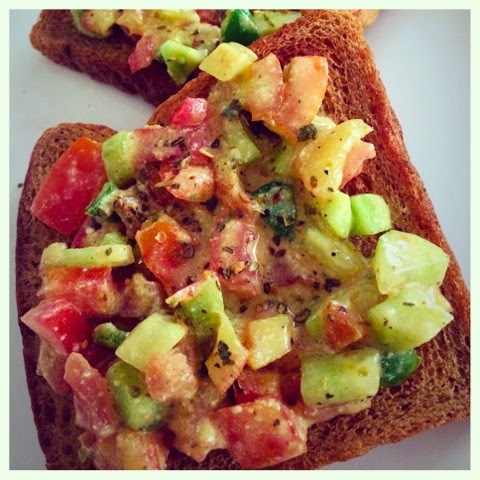 This post is about a quick fix for a yummy healthy breakfast. Gone are the days when health and taste seldom stood hugging each other. With changing times and changing mindsets people are coming up with delicious yet healthy preparations. So, the other day while I had little time to prepare a wholesome breakfast I resorted to making these toasties that I swear by. These toasties are amazingly easy and they don't lack even one bit when it comes to taste. * mix together in a bowl the wet ingredients (yoghurt, mustard sauce, ketchup and lemon juice) with salt, pepper and oregano. * drop in the chopped veggies and fold them well so that they are evenly covered with the dressing. * put the dressed up veggies on your toasts. Sprinkle some oregano and pepper on top. Your quick toasties are ready to be devoured. Now aren't these easy and take my word, they will be lip smacking. * you can use other veggies too like broccoli, red and yellow bell peppers and sweet corn. * also you can use chopped fresh coriander and mint. I used whatever was available in my kitchen that morning. * while I love to have these for breakfast, you can cut the toasted slice into four squares and top them with the veggies for an evening snack. Wow looks yummi :) To be very frank I hope it is good for diabetic people like me too.